Caite Hevner, a 2006 graduate of the School of Theatre’s Bachelor of Fine Arts Design/Tech program, is one of six recipients of the inaugural Reubin O’D. 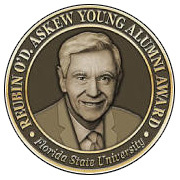 Askew Young Alumni Award. She was selected from a pool of 30 nominations and was awarded the honor at a reception and ceremony held at Tallahassee’s Hotel Duval on Friday, May 18. The Reubin O’D. Askew Young Alumni Award is part the “Thirty Under 30” program sponsored by the Alumni Association. The aim of the new program is to shine the spotlight on young graduates, defined as those under the age of 30. This first-ever class of 30 Florida State alumni were selected by fellow FSU graduates for their contributions to their professions, communities or FSU. Caite’s career since graduation has flourished, with professional credits that include set designs for The Juilliard School, Studio 42, the Yale Dramat, the New York Musical Theatre Festival, and the New York International Fringe Festival. Favorite scenic design credits include Triassic Parq, a new musical opening off-Broadway this June. As a projection designer, Caite has designed at La Mama’s Ellen Stewart Theatre (NYC), the Flea Theatre (NYC), Williamstown Theatre Festival, the Greenwich Music Festival, and the Allentown Symphony. As an assistant/associate, credits include the Tony award-winning musical Memphis, a show that also garnered Drama Desk and Outer Circle Critics awards, Colin Quinn Long Story Short on Broadway, as well as the critically acclaimed Angels in America at Signature Theatre in NYC. In addition to her degree from FSU, Caite holds a Master of Fine Arts degree from NYU Tisch School of the Arts and a Graduate Certificate from Yale School of Drama. Caite will be an adjunct faculty member this fall at Ramapo College (NJ), teaching scenic design. She is a member of Wingspace, a collective of artists, designers, writers, and thinkers committed to the practice of collaboration in theatrical design.